Once the lifeline of people in Bandipora and Sopore, the Wular Lake is choking with sewage and garbage. One of the country’s largest fresh water lakes, Wular, located in the northern part of Kashmir, is struggling to survive as it battles against dumping of sewage and garbage, leading to its slow death. Illustrious for its natural beauty, Kashmir, the homeland of rivers, lakes, ponds, springs surrounded by the Himalayan mountains, attracts thousands of tourists from across the world. Wular was once the main source of fresh water and livelihood for many families in Bandipora and Sopore areas ofNorth Kashmir. It was famous for producing high-quality fish and water chestnuts. However, over the past century, the lake has shrunk by 45% -- from about 158 sq. km in 1911 to 87 sq. km in 2007; with only 24 sq. km of open water. Water from the lake was drained by the government to plant willow trees, used to make cricket bats, boxes, firewood and other commercial products. Although this move created jobs for many, it also began the process of destroying the livelihoods of families dependent on the lake. Firdous Ahmad Bhat, a 35-year-old fisherman living in the village of Watlab by the lake, is one of the many affected by pollution and shrinkage of Wular lake. For generations, the Bhat family made their living from catching fish, cultivating chestnuts and lotus stems in the lake. Firdous had learned the necessary skills to fish and farm from his father. When he was 15 years old, his father died of cancer, leaving him shouldering all his responsibilities. Being the only son (he has three sisters), Firdous began to follow in the footsteps of his late father. “Since the death of my father, every morning I take his boat and go fishing and undertake other cultivation,” said Firdous. When he started out about 20 years ago, he caught between 30-40 fish per day. Now he counts himself as fortunate if he catches five to seven fish a day. The lake has witnessed severe degradation. Parts of the Wular are dumped with dead carcasses of animals, polythene and garbage. All the main drainage pipes from South Kashmir, Srinagar and other parts of the valley, open directly or indirectly into the lake via Jhelum river, bringing in tonnes of untreated sewage. “Now every time I go fishing, I cross dunes of garbage and dead bodies of animals. Due to this pollution, the growth of fish in the lake has sharply declined, and the water that was once pure, is no longer so,” says Firdous. High nutrient levels in the water due to sewage, has covered the lake with weed. This prevents oxygen from dissolving into the water, making it difficult for fish to survive. “I collect the weed from the lake and dry it. Then I convert it into manure and fertilisers. It is also used to make paper,”he adds. By collecting weed from the lake, Firdous is not only earning money but also helping in cleaning the lake. But the income that Firdous fetched from fishing, cultivating chestnuts and lotus stems cannot be matched by weed. To conserve natural resources and also protect their source of income active, villagers have approached many government authorities, seeking help for clearing the lake. However, instead of paying heed to their request, the local municipal authorities have created a dumping site near the bank of the lake. Nusoo, a village in Bandipora district, located on the bank of the lake, has turned into a dumping site by the Bandipora Municipal Committee, villagers told NewsClick. Hilal Wani, a 26-year-old man and resident of Nusoo, claims that local municipalities are dumping at least 100-120 tonnes of waste daily into the water body, both directly and indirectly. Every day at around 11 p.m, mini municipal trucks with the slogan, ‘Save Wular’, written on them, dump garbage into the lake. The trucks have been donated to the municipalities by the Wular Conservation Management Authority (WUCMA), an agency established for conservation of the lake. Villagers say that accumulation of garbage has turned the water body into a breeding ground for mosquitoes, making it a source of diseases. Apart from the stench emanating from the lake, residents also complain of air pollution due tothe burning of dumped garbage. In another village by the lake, Laharwarora in Bandipora district, garbage, especially plastic bottles, has become an income source for 17-year-old Bilal Ahmad Dar. Every morning Bilal takes his boat to the lake to collect trash and sells it for recycling. He earns Rs 6,000 a month by clearing the lake of 1,240 kg of garbage. In March 2017, Bilal was noticed by the Srinagar Municipal Corporation (SMC). But, instead of giving him a team to clear the lake, he was given a job as a sweeper at SMC. Villagers contend that all the money and initiatives for clearing water bodies are focused on Dal Lake in Srinagar, sincethe lake is a tourist attraction and brings in high revenues to the state. Surrounded by the many Mughal gardens, the Dal Lake has become one of the top tourist zones in world, withhouseboats and shikaras as major attractions. 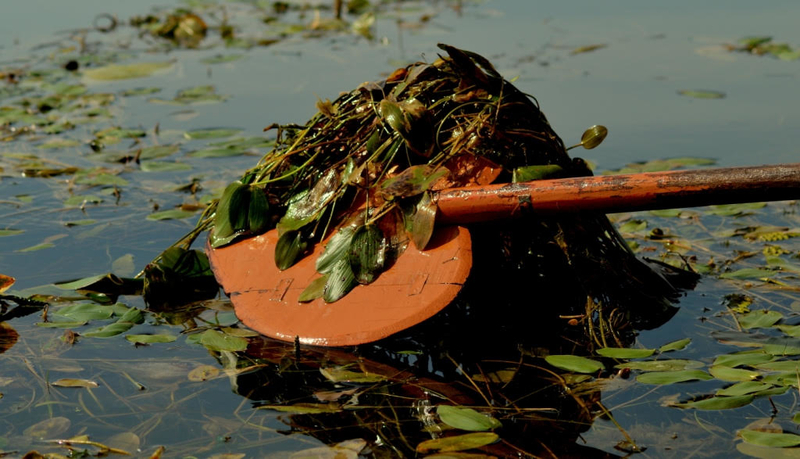 However, experts believe that weed harvesters, who clear the weed in Dal Lake throughout the year, are harming thelake’s ecosystem. Humaira Qadiri, who heads the department of Environment Science at Sri Pratap Singh College of Srinagar, says that weed helps water bodies in self-purification. “However, there are different stages in which weed releases and gains nutrients from water. If the weed is in the stage of reproduction and is removed, that is very harmful for the water body,” says Qadiri. Harvesting machines don’t remove weed from its root, the way Kashmiri boatmen were able to do with their hands. This has been leading to excessive growth of weed. Humaira believes that manual removal of weed was more effective and also provided employment. Qadiri further suggested that student research thesis’ on how to save different ecological resources, such as water, forest, etc. are gathering dust on the shelves of universities, adding that the knowledge produced by the researchers should be utilised by the authorities to build resilient ecosystems and manage waste. “This kind of ecological degradation is seen across India. We need to quantify and communicate the multiple ecological, economical and public health benefits from ecosystems. In addition, a deeper understanding of how watersheds and waste-sheds overlap is critical to design and act better with regard to natural resource and waste management practices,” says urban planner Jeenal Sawla, an urban planner who graduated from Harvard University. “No doubt, Kashmir is full of natural resources, but as poet Samuel Taylor Coleridge said, ‘Water, water everywhere, nor any drop to drink,” Qadiri said.